Posted byBob Ramsey	 March 7, 2014 May 15, 2015 6 Comments on Go AWAY! I saw this sign on a storefront while browsing an historic downtown shopping area. 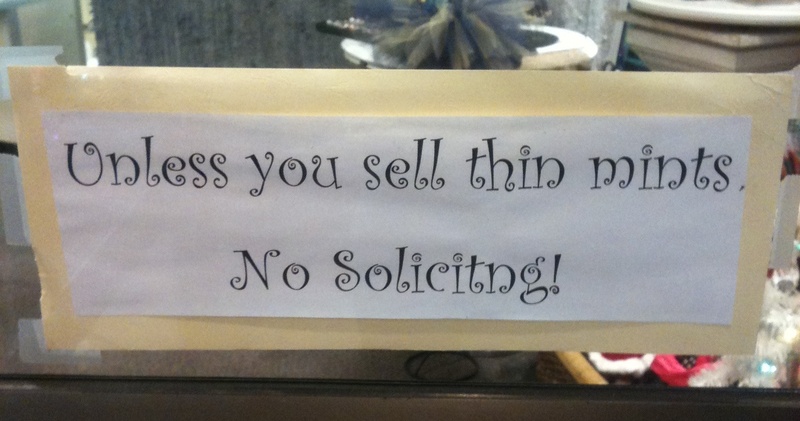 I thought how interesting that they were using this sign to sort out sales people from ones with crediblity (girl scouts) to sales people without credibility (everyone else). So, why do the girl scouts get a pass? What do they have that lets them in the door when everyone else gets the go away sign? Credibility is something all salespeople need to make progress in a sale. There are several ways to gain credibility and everyone’s favorite is…a referral! We love referrals because we’re already believed before we even get there! In a way, girl scouts are getting a referral. The above business believes in girls scouts because of some girl scout in their past. Some salespeople manage referrals so well, they never need to prospect. For the rest of us though, prospecting is a part of life. How do you gain credibility quickly when the “go away” sign is spoken or shown to you? This is a key skill that every salesperson and business person needs to attain. In our sales training, we help sales people develop credibility quickly by demonstrating. Not demonstrating their product, but demonstrating things like their competence. If you are the absolute expert in some area someone has an interest in, your expertise just might open that door for you. The world’s expert is very competent and that means something to a prospective buyer. Almost nobody wants to even give 3 seconds to a salesperson without personal and professional competence. Your appearance makes a lot of difference in this regard. Think about going to a doctor who was dressed in a car mechanic’s uniform. Or maybe you need to visit a funeral director and they’re dressed in a clown outfit. We know that those clothing choices make no difference in their real capability in doing their job. But we can all see how that would hurt their credibility. So, dress and groom yourself like the most successful person in your field. Give your prospects’ first 3 seconds every reason to believe in you. Another way to demonstrate competence is to state it. I once was about to catch a flight in a very small commercial airline with very old and small airplanes over a mountain range in very bad weather. Before we left the gate, the very young captain (can you get the idea here that I was wishing I wasn’t on that flight?) came into the cabin and announced that he had flown this same airplane dozens of times over these same mountains in weather just as bad as this. And before this, he had landed navy jets on an aircraft carrier in pitching seas at night hundreds of times. That made me feel better about my prospective “purchase”. Wouldn’t it help you? I think salespeople forget that they need to build credibility. If you know your product is good, and you know you are good, and the last customer knew you were good, sometimes you assume that the next prospect will know that too. Well, you have to build credibility every time. Just like the above sign says, you aren’t trusted yet so don’t assume you are. And if you demonstrate credibility well, we just might trust you like we do the girl scouts. Instead of being shown the door.